An insurance adjuster wants to meet with me to settle my car accident case. What should I do? If you were involved in a car accident where you were just the passenger, you most likely were not at fault whatsoever for causing the crash (unless you were unreasonably distracting the driver of the car you were in). In this event, you may be able to pursue a claim against both the driver of the car you were involved in and against the other party as well. Ultimately, it comes down to who is at fault. In many car accidents, only one party is at fault. For example, if you were stopped at a red light and were rear-ended by a driver behind you, the car behind you will be 100% at fault. In situations where only one party is at fault, you will only be able to pursue your bodily injury claim against the party who is at fault. 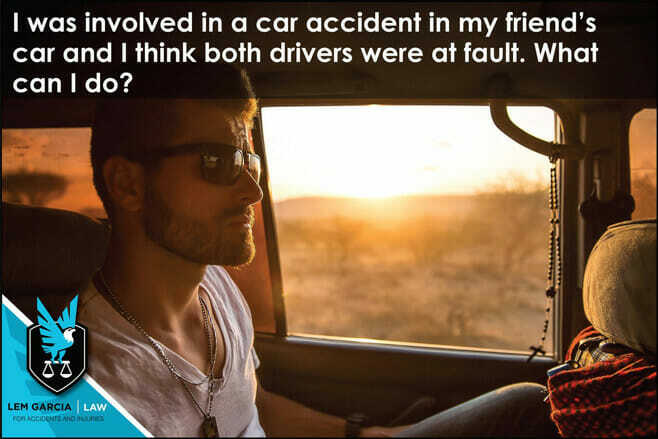 However, if you were involved in a car accident where both parties are at fault, you will be able to pursue a claim against both parties. For example, if you were involved in a crash where the driver of the car you were in drove through a stop sign and the other car that hit you also drove through a stop sign without stopping, both parties would be at fault. In this situation, you would be able to pursue a claim against both parties and get compensated from both of their insurance carriers. If you were involved in a car crash as a passenger and nobody can prove who is at fault and both parties are pointing at each other, you will still be able to pursue a claim against both parties, because what is absolutely clear is that you were not at fault and their negligence caused you to get injured. You will not be able to prove who is at fault, but you can prove that you were not at fault and most likely the insurance carriers will be able to come to an agreement as to how much each respective party should pay. When you’ve been involved in a car accident as a passenger, it is important that you have someone advocating for your rights. Insurance companies will not accept liability when they can deny a claim. Make sure to get an experienced personal injury attorney to get you what you deserve. West Covina car accident lawyer, Lem Garcia, helps passengers who have been injured in car accidents with their bodily injury claim. Case consultations are always free and without any obligation.